It was recently pointed out to me that I was approaching my 100th match. I hadn't realized it and when I was first made aware, it didn't seem to mean much. But after having a chance to reflect on 100 matches, I realized it was a big deal - to me at least. 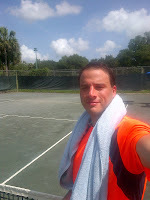 I joined TennisCleveland.com in the summer of 2011. I had played tennis on vacation with my wife with a group of retired men and women in Hawaii in a round-robin mixer type activity. I had played casually with friends before, mostly just singles, but after this one day, I realized I wanted to play more. We got home and I did a search for tennis leagues in the Cleveland area. I signed up and I was hooked. I remember vividly my first match. I was nervous, mostly afraid of looking foolish, but the gentleman I met that day made me feel at ease. See, it was also his first match, too. We had a nice match, despite the result, a resounding 6-1, 6-2 defeat. Although, in retrospect, the loss was against the eventual champion, so nothing to hang my head over. Needless to say I was hooked. I signed up for Spring, Summer and Fall in 2012 and couldn't play enough. My "lessons" were earned on the court. I am a competitor, so I struggled with balancing winning with working on some of the fundamentals. I still do. There are just some matches where you really feel like you need that win to help your morale, or to overcome a hard day at work. But that's what keeps us coming back, right? I've met some incredible people and had some amazing matches. The highlight of 2012 was going down to Florida for the year-end tournament and meeting other enthusiasts from the other networks around the country. If you have the means and the opportunity to do this, I highly recommend it. Oh, and winning my first championship trophy (yes, first....beware TennisCleveland players, there will be more!). 2013 is off to a great start. Match 100 was last night in 93 degree heat. I lost easily 6-2 6-3, so that is in a way serendipitous to the way I started almost 2 years ago. 54 wins and 46 losses later and I plug on. I love meeting and playing new people, so if you are ever coming through Cleveland, look me up, I'd be happy to play!